J.D. Power and Associates released a new Gen Y study analyzing discussions on social media that reveals, not surprisingly, that emerging generations have a negative outlook on cars being a fundamental part of their culture. – Gen Y is more about spending big on technology than spending big on a car. – Gen Y averages 3 hours per day online – mostly on facebook and other social media sites. – Gen Y cares more about reviews than advertisements. – Gen Y does not respond to advertisements like previous generations – they like to build relationships. – Gen Y does more research on purchases than any other generation. You can see in the study’s finding below that as you go from early careerists to teens, it goes from disregard for what the auto industry is providing to disregard for owning a car at all. “Also, with the advent of social media and other forms of electronic communities, teens perceive less of a need to physically congregate deliberately, and less of a need for a mode of transportation, in favor of environments that allow more spontaneous physical interaction.” Which is, in fact, the way we used to congregate before cars. If this is what emerging markets demand, yet the established generations in control of the supply don’t know how to provide for it, now you see why crowdsourcing is so vital. 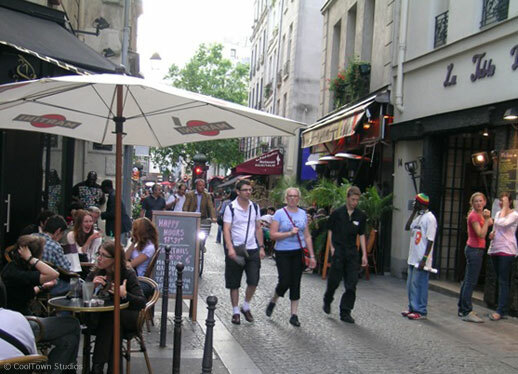 Image: Pedestrian only street and outdoor cafes in the Marais, Paris.